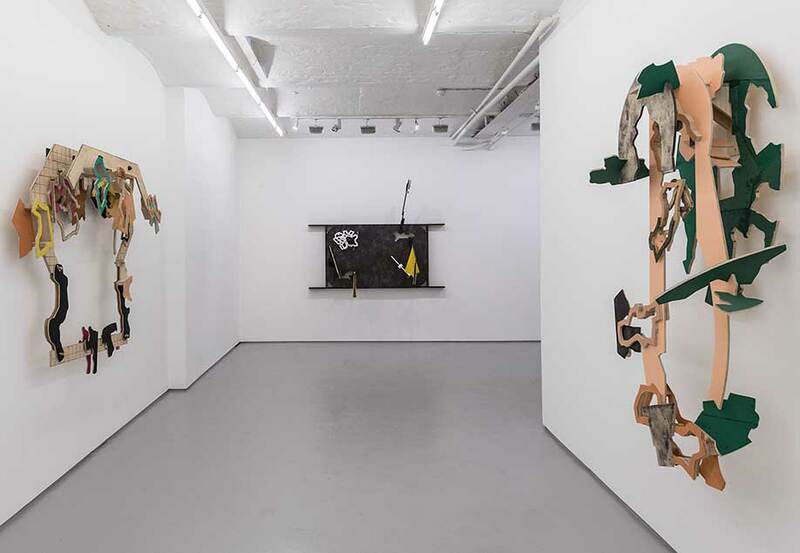 To coincide with his first solo show in the UK at the Fold Gallery, London, Thomas Bang answered five questions set by writer and critic Sam Cornish. Do you consider yourself more of a painter or a sculptor? I consider myself, and am considered in general, to be a sculptor. I have worked with a wide range of materials and methods of manufacture over the years, collage being one of them and also intarsia1 from time to time. I expect intarsia to turn up again in my work in the near future. Fabric in various contexts has appeared actively in the work since 1968, often as a curtain or pelmet. Curtains figured prominently in a series of installations of picture-window size with the title: “Seven attempts to create an adequate view” from 2001. That view was, however, never attained. I mention the curtain category, since both curtains and collage perform a concealing function, of which I have made use. I find intarsia 1 of interest, since it breaks into an otherwise continuous surface and can have an extremely disruptive function both physically and visually. You were in the exhibition When Attitudes Become Form (1969), in Bern & London. Did it feel important at the time? Yes, it felt and was immediately considered important at the time. This exhibition has, as you know, since become one of the main reference points when considering cutting-edge art during the late 1960s. I was rather fortunate to be included in the show, since I lived somewhat “tucked away” in Santa Barbara, California at the time. Just by chance, I recently read a very interesting article by the British art historian Alison M. Green, focusing on the history of the critical reception of Harald Szeemann’s exhibition. One of Green’s significant observations, that focuses on Szeemann’s unique way of organizing art exhibitions, is her comment that “What is clear is that the Attitudes show offers an interpretation of late-1960s art that is quite different from the mainstream of art historians and theorists writing about the same time and the same artists. This is your first solo exhibition in the UK. Why do you think this is? And are there any artists from Britain you feel an affinity with? I have no idea why my work hasn’t been shown earlier in the UK. Kim Savage saw my work when I participated in the Artissima Art Fair in 2016, showing with my Copenhagen gallery KANT in the “Back to the Future” section. Kim came to Denmark in 2017 at the time when I had a retrospective at Esbjerg Art Museum. Here he was able to view early work from 1968 and up to the present, which was very fortunate and this led to the present exhibition at FOLD. I am aware of only one British artist who is working in a territory somewhat similar to mine, and that is Simon Callery. As far as I know, Callery began cutting into his large expanses of hanging canvas planes about 2014, exposing portions of layers located in the back. He is a very interesting artist. Why states of discontinuity rather than states of continuity? Stencil components are initially cut out of the plywood sheets that constitute the shaped panel planes in up to four layers, which make up the works. Good examples of the character of the stencil elements can be found in the middle and lower portion of the work Intruder, No.2 (2014). At times traces of stencil components are also to be found as cut-away sections as in the left panel of Towards Other Possible Conditions, No.2 (2018), where a number of large gaps dominate the panel. Numerous fragments derived from the stencils used on this panel are to be found on the right panel. A gradual process takes place of cutting out stencil components and attaching them to the panel planes. I see it as a strewing about of fragments of stencils. In many cases, the exact placement of segments is not as important as providing a total, where it becomes apparent that the activity is a result of modifications, cuts, partial restorations and further breakdown. Leather or textile patches are from time to time added to the stencil components, partially cut free, resulting in a peeling gesture and are frequently unidentifiable as being derived from a particular stencil. This is quite apparent in the work Diagrams of Intrusion and Displacement, No.2 (Double sided) (2010) and Interloper, No 3 (2018). I should add, that the many small bits and pieces of leather attached to the front T-shaped unit on the latter come from stencil components found in the former. The initial decision to work with layers of up to 4 planes, stems from an interest in the theatre of the past with its set-pieces structured in layers. In these works, such as the two mentioned above, it is difficult or impossible for the viewer to distinguish all the activity occurring between the layers of planes. These spaces sandwiched between the panels are of extreme importance, in that they are deep enough to create a significant movement out from the wall, of up to 74 cm, and yet manage to partially obscure the activity taking place between the layers. It is this activity of concealing and especially the fragmenting and reconstruction or modification of components that creates the condition of discontinuity, which to varying degrees permeate the works. In a sense each work “feeds” off itself in a continuous breakdown and rebuilding of components. I encountered the Theatre of the Absurd in the early 60s, when I was still painting. I was entirely overwhelmed by the sheer brute force with which these plays manifested themselves. It was a few years later, when I had begun working in the three-dimensional area, about 1967-68, that the multitude of components that make up the dramas in this genre became fully clear to me. I was fascinated by the transgressions of the confines of the realistic theater, especially the significance of the unique visual aspects, which actively partook in structuring the plays. I recently saw Beckett’s Not I for the first time, where the image of a woman’s illuminated mouth is suspended on the stage surrounded by total darkness, from which issues a rapid stream of words. Imagery such as this, of utter bleakness, coupled with the juxtaposition of incongruous characters, creates a structure of entirely unpredictable dimensions. I liken this to my experience of a range of music that interests me (an entirely unprofessional listener) such as the early compositions of the composer Krysztof Penderecki and Britain’s Thomas Adès (not bleakness in him, but exciting structure). These are a few of the sources, past and present, that have had a lasting impact on my thinking in relation to my work.